Nestled on a cliff overlooking the sparkling blue Pacific Ocean and Kauai's famous Anini Beach, Sealodge is considered by many to have the best views on all of Kauai. 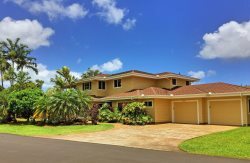 Many units have views expanding all the way out to the historic Kilauea Point Lighthouse, plus views of the reef below, the great North Shore surf and the amazing Humpback Whales in season abound from this wonderful condominium complex. This was the first condo project built in Princeville and the developers had their choice of the best parcels and chose the current location, with its seclusion and privacy on which to build their project. At Sealodge many units have recently been upgraded to have interiors as spectacular as the view. The project is located at the end of a small private road and features a swimming pool, barbecue areas and a trail down to quiet and secluded Sealodge Beach where you may very well be the only swimmers at this small sandy cove tucked under the cliffs above. Come and enjoy Sealodge for its quiet setting, for its beautiful grounds, but mostly for its expansive and unparalleled ocean views.